Whatever your vacation pleasure, Rosarito Beach is an endless playground for swimming, surfing, fishing, shopping, tennis, golf, horseback riding on the beach, dancing, dining, ATV dune buggy riding or just relaxing on the beach or at poolside. It’s all here in Rosarito Beach. Rosar­ito Beach officially stretches far up and down 20 miles of Baja California’s beautiful gold coast. Best of all, it’s only 30 minutes away from San Diego. For information about the Rosarito Beach area as well as the over 40 major events held here annually, call the Committee of Tourism & Convention Rosarito Beach (5) (01152-661-612-0396). They’re located in the Oceana Plaza and are open Mon.-Fri., 9 a.m.-5 p.m.; however they are closed Sat.-Sun. Their knowledgable bilingual staff can answer virtually any question you may have about what to do in Rosarito Beach. Getting to Rosarito Beach is easy after crossing the border, follow the green toll road signs that say “Ensenada Cuota.” They will lead you out of Tijuana proper to the coast and the toll road From the tollbooth, you will be only a few scenic minutes from Rosarito Beach The cost by car for the toll booth varies with the fluctuation of the peso, but it is about ($1.80) each way via the toll road. Take any of the three exits that say Rosarito Beach, and you are there. Mexican auto insurance is a must because your U.S. insurance policy is not valid in Mexico. So be sure to buy Mexican insurance. Sign up online with BajaBound.com, which is the quickest, easiest way to be insured reliably without having to stop at the border. The reason why you need Mexican Insurance is that your American insuance carrier is not recogonized in Mexico. So if you get into an accident you and your car will be retained until the guilty party is determined by a judge. To avoid this hassle, get Mexican insurance. It’s as simple as filling out a form on your cell phone while speeding down the freeway towards the border. There is an excellent selection of accommodations to choose from with the top hotels offering everything from ocean views, to on site restaurants with cocktail lounges. Some even offer complimentary margaritas and/or complimentary breakfasts. 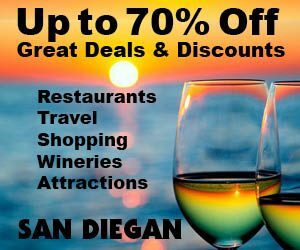 So take advantage of staying in these magnificent oceanfront accommodations while enjoying a delicious lobster dinner and shopping or just relaxing at one of the beautiful resort hotels that line the seashore is hard to beat. Yet, not to be out done, still other hotels without ocean views still offer a competitive edge be it an appealing location near shops and restaurants or are just out of town for a less busy golf resort setting. Rosarito Beach Hotel (7), Blvd. Benito Juarez 31, Rosarito Beach Centro (01152-661-612-1126). Prices online from $110) . This landmark beachfront hotel is celebrating its 92nd. year and is still “the place to stay in Rosarito Beach”. It offers 500 rooms and a ton of extras like complimentary margaritas, class restaurants and an unobstructed oceanfront view. Other extras include cabanas on the beach, a swimming pool, their own pier, horseback riding on the beach. You name it they have it with all the charm of old Mexico or first class accommodations in their high rise buiding. Take your pick. Credit cards: AE, MC, VISA. Festival Plaza Hotel and Entertainment Resort (6) (800-453-8000) or (01152-661-612-2950). This great 8 steory downtown Rosarito Beach resort has ocean-view rooms, casitas and private villas. Be their guest or drop by for a visit when in Rosarito. You’ll find a variety of award-winning restaurants, shops, artisan’s market, swimming pool with a swim-up bar, ferris wheel, night clubs, cantinas, casitas, studios and a ocean view penthouse. In fact, they have the best nightlife in town at the world famous Rock & Roll Taco and at their beachfront restaurant called Sol Cafe. Credit cards: AE, MC, VISA. Del Mar Inn (Brisas del Mar) (4) at Blvd. Benito Juarez, one mile south of the Hotel Corona, on the left side of the main street of Rosarito Beach (888-871 3605) or (01152-661-612-2547). It’s within walking distance to all restaurants, shopping and attractions. Rooms include an ocean view, heated swimming pool, color TV air conditioning, bathtubs, telephones, an on-site restaurant open from 8 a.m.– 10 p.m. as well as a cocktail lounge. Credit cards: MC, VISA. Souvenir shopping in Rosarito Beach is almost exclusively along its one long, main thoroughfare, Boulevard Benito Juárez, which travels in a north-south direction. The south­ernmost landmark for a shopping adventure is at the arcade shops in the Rosarito Beach Hotel (7). Here you’ll find intriguing and charming merchandise from all over Mexico as well as unique imports from Europe. For European imports, shop here at the impressive Casa Torres Rosarito (01152-6-612-1008). For all of your medial needs look for Farmacia Gusher (16) (01152-661-612-1722). With additonal locations in Tijuana they have everything from medicines and suntan lotion to delicious tasting tropical smoothies. They are open 24 hours a day 7 days a week. Credit Cards: MC, VISA. The rest of your shopping tour needs to be done by car. And the rewards are many. For example, A half mile farther north on the west side of the boulevard is Quinta Plaza Shopping Center (14). This is a very important shopping destination, and the reasons are numerous! To begin with, it’s one of only four locations in Rosarito Beach where you can buy gasoline for your trip home. At this Pemex gas station (7) you can also have your car washed or get your tire changed. You can even buy beer and sodas at their convenience store. Also located at the shopping center are sev­eral excellent restaurants and a supermarket. Bajamar is a maginificant golf resort overlooking the Pacific Ocean. It typifies the variety of lifestyles available for your considerations for places to live or vacation in luxury. Bajamar is only 30 miles south of Rosarito Beach, on the scenic Ensenada toll road making it freeway. It’s an impressive oceanfront golf resort and new home development and resort. It features 27 holes of championship golfing, excellent accom­modations, beautiful new homes and scenic lots. Hotel accommodations range from ($125 to $200) a night and the amenities for golf and relaxation are staggering. If you’re already in Rosarito Beach, you’re practically there. The scenic toll road makes a trip to Bajamar a half hour away. If you didn’t bring your golf clubs, you can rent them there. For tee-times call (619-425-0081). Playing their Scottish links-style courses that integrate the natural Baja environ­ment into the pleasures of the game is a real thrill. Just imagine the challenge of playing your tee shot along a cliff above the pounding Pacific surf. The fragrant aroma of blooming desert lavender lingers in the breeze as you pitch up onto a manicured green. For an enchanting golf getaway for a day, a weekend or longer, stay at the Hacienda Baja Mar. For reservations call ((619-425-0081) There are also attractive packages for golfing and accommodations at their colonial-style rooms and suites. For break­fast, lunch and dinner, dine in their restau­rant, Dos Lagos Restaurant Their weekend breakfast buffet is a real winner! It’s open daily from 7 a.m.– 11 p.m. and is a perfect conclusion to a wonderful day. This retreat is so special that you don’t have to be a golfer to enjoy the relaxed lifestyle that has made this Baja Mexico resort a great weekend getaway. Las Rocas Resort and Spa (12) (01152-661-612-2140) is just six miles south of Rosarito Beach at km 38.5 on the Tijuana-Ensenada Toll Free Road. For reser­vations or information call toll free (888-LAS-ROCAS). Summer rates are ($89-$279). If you haven’t had the good fortune to visit the Greek Islands, then you will be pleasantly surprised to know that you can capture the beauty and ambience of Myconos and Santorini at Hotel Las Rocas. Las Rocas offers a breathtaking oceanfront setting, diversity of accommodations and an award-win­ning restaurant. Each room has a private balcony and a spectacular oceanfront view. Las Rocas, a fantastic weekend destination, is also a wonderful mid­week getaway, especially now with their day spa and gym. The day spa offers massages, facials, hydrotherapy, wet room, full salon treatments and more. Here, peace and privacy are prized above all other commodities. Relax beside the uniquely designed infinity pools on a cliff overlooking the Pacific, or in one of three Jacuzzis. You can also enjoy tennis and sand beach volleyball. Credit cards: MC, VISA. La Flor de Michoacan (14), 291 Juarez Ave., Rosarito Beach (01152-661-612-1858). Open daily for break­fast, lunch and dinner 9 a.m.-10 p.m. Closed Wed. ($6–$22.85). In 1950, Mr. and Mrs. Ochoa came from the state of Michoacan and started a little restaurant in Tijuana. Then one day when the couple visited Rosarito Beach for the first time, they fell in love with the place and decided to build a little stand by the side of the road, right where the restau­rant stands today. Now, over 50 years later, Prospero and Juanita Ochoa and their family keep welcoming old customers and new customers, who come looking for the excellent taste of carnitas (roasted pork) from the state of Michoacan. Two locations. Full bar. Credit cards: none. El Mesón Restaurant (12), in the Las Rocas Resort and Spa, just six miles south of downtown Rosarito Beach km 37 on the Tijuana-Ensenada Scenic Road (01152-661-612-2140) or (888-LAS ROCAS). It’s open daily for Sunday Brunch 7:30 a.m.-3 p.m., lunch and dinner Here, you can expect to enjoy romantic dining enhanced by flickering candlelight, swaying palm trees, and a romantic ocean view. The menu features lots of fresh seafood including lobster and perfectly cooked steaks. They also have a new healthy spa menu. Also excellent is their Caesar salad for two. You can enjoy live guitar and classical music Fri. and Sal. while dining in their restaurant having a drink in their Ole Bar or taking in a panoramic view from their thatched roofed La Palapa Bar. Full bar. Credit cards: MC, VISA. El Nido Restaurant (1), Benito Juarez Blvd. #67 (01152-661-612-1431), Open daily 8 a.m.-midnight ($6-$21). El Nido Restaurant has such a loyal following that have been coming here for 50 years. Now it’s your turn to discover what awesome mesquite grilled cuisine is all about. Plus, the tropical decor in two sections of the restaurant with splashing water falls in a tropical setting is awesome. The other dining rooms are just as unique. The specialty of the house is delicious filet of beef cooked on an open grill with mesquite wood. The flavor of mesquite in the beef entrees is memorable. A specialty cut of the house is a porterhouse steak, served with a huge baked potato, deli­cious bean soup and a tossed salad. Other entrees include New York steak, filet mignon wrapped with bacon, quail and lobster. You won’t find a better steak house in Baja! So dine here! Credit cards: none. Los Pelicanos Restaurant and Hotel (3), in the Los Pelicanos Hotel at Calle Ebano 113, Rosarito Beach (01152-661-612-1757). Open daily for breakfast, lunch and dinner 8 a.m.-midnight ($6-$21). Enjoy a fabulous meal overlooking the ocean. Dine inside in a cozy dining room or on an incredibly romantic oceanfront terrace, which also happens to be the best place to watch the sunset. Meals include a fantastic cup of soup, a crisp salad and a steaming baked potato. The Caesar salad is superb. Enjoy great-tasting steak cooked over mesquite wood, plus quail, chicken and shrimp cooked four ways, as well as fresh fish and combinations such as their tantalizing steak and lobster combo. Their homemade flan is highly recommended. Their adjoining hotel is a popular place to stay. Full bar. Credit cards: AE, MC, VISA. 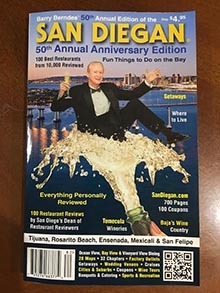 Seven miles south of Rosarito Beach is the world famous Puerto Nuevo (13) affectionately called the Lobster Capital of the World by its many diners who frequent this landmark dining destination. Attesting to it’s popularity is that they literally serve over 1,000 meals every weekend. How this small fishing village made it into the history books is an interesting story. Puerto Nuevo was founded in the 1940’s. Around the 1950’s, three families of fishermen form the state of Jalisco, Mexico arrived in Puerto Nuevo. They worked at what they knew, which was fishing. During the weekends, they would take out fishermen on their boats, and invite them to their homes for dinner. Gradually, these visitors began returning to the locals’ houses, and would ask the wives of the fishermen to cook them a lobster dinner like they had enjoyed on their previous fishing trips. Be sure to dine here. 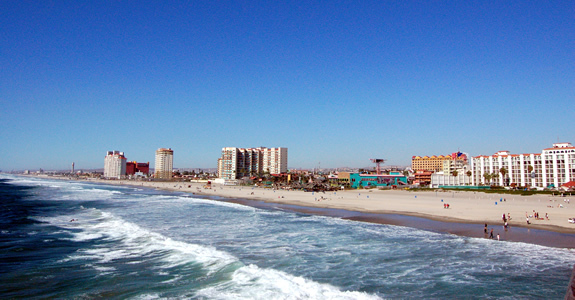 After spending a weekend or longer, it’s not uncommon to fall in love with Rosarito Beach. In fact, there is a large colony of American citizens living there, as well as throughout Baja California. You can actually buy ocean-view homes for ($49,000-$130,000) and land for a whole lot less. Call or visit Americana Realty (9) in the Oceana Plaza, suite 28 (01152-6-612-2419); fax (01152-6-612-1034). Owners Pancho P. Marty, Maria Antonieta Sori­ano, Juan Araiza and Jorge H. Soriano all speak English and have years of experience in assisting home buyers in the Rosarito Beach area. Ask about their sales, construction and even assistance,, with remodeling. They are open Mon.-Fri., 10 a.m.-6 p.m. and Sat 10 a.m.-3 p.m. at the Oceana Plaza, suite 28. Their U.S. mailing address is__4492 Camino De La Plaza, Box 603, San Ysidro, CA 92173.